These nine pretty jam jars are perfect for anyone with a sweet tooth! 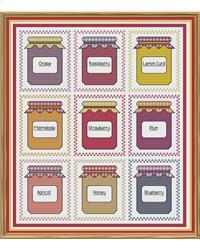 A variety of jams, jellies and marmalades to entice you into having a sweet dessert. This piece would look fabulous in a country kitchen to brighten the décor, or as a gift to someone who enjoys making their own preserves. The design comprises whole stitches, half/three quarter stitches and some backstitch, so it is a pattern that may not be suitable for a complete beginner. Project Size: 8" x 9"